Providing always up-to-date and exhaustive documentation for your WEB API could be quite a challenging task. Swagger and Swashbuckle did a great job to provide uniform documentation for any kind of API. Let’s look into this using simple demo discount API example. First, create empty ASP.NET Web API project. Add new controller – DiscountController inside Controllers folder. Swashbukle page says: Seamlessly adds a swagger to WebApi projects! And it works in that way, all you need is to install it from Nuget and you are ready to start. What is correct format for dates? How much decimal point is supported for Value field? What fields are really optional? Let’s try to answer all those questions by providing XML comments for model properties. 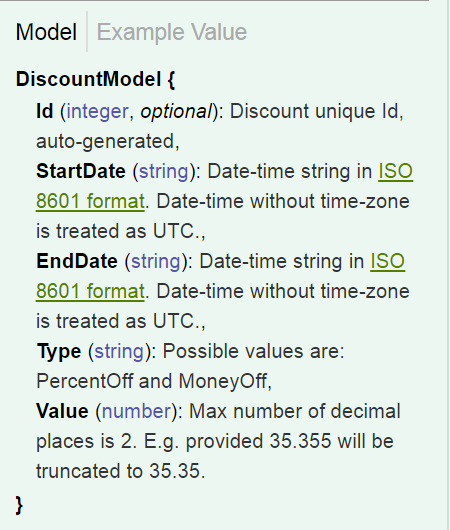 /// Date-time string in <a href="https://en.wikipedia.org/wiki/ISO_8601#UTC">ISO 8601 format</a>. /// Date-time without time-zone is treated as UTC. /// Max number of decimal places is 2. E.g. provided 35.355 will be truncated to 35.35. Go Project Properties => Build section => Check XML documentation file checkbox. Let’s build and run the project, now model looks much nicer providing guidance on how to use discount model. Enabled Swagger documentation for Web API project. 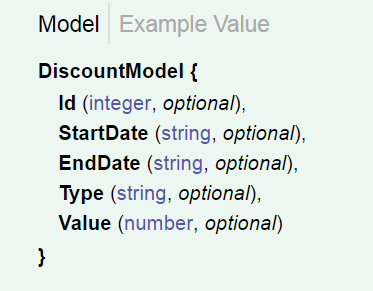 Added model property XML comments to provide information about expected input options and its format. Used DataAnnotations to document required model properties. This entry was posted in Documentation, WEB API and tagged Swagger, WEB API. Bookmark the permalink.